Five years ago or thereabouts, I read a novel set in medieval Languedoc in southern France. It was a good book, but I’ve forgotton the title and the author’s name. I do remember the gist. The heroine was a Cathar princess who, with the whole population of her town, Carcassonne, was exiled and forced to hide in the wilds of the Pyrenees. She survived along with half a dozen of her fellow believers, certain that most of her townspeople had died. They had all been routed from their homes with nothing, naked or wearing only undergarments; no food, coin, livestock, household goods, farm implements, or even seeds. They fared better than the people of nearby Béziers, however. Everyone in that town was murdered. Everyone. I’m afraid I read this tale simply as a stirring, fantastic work of fiction, but I wanted to learn more about the Languedoc so I looked it up on Wikipedia. What I discovered knocked my socks off. "Kill them [all]! Surely the Lord discerns which [ones] are his". All the babies in Béziers, all the old people, even all the people who might have been faithful to the “true religion” were murdered in the course of a day’s work. A killing frenzy if ever there was one—perpetrated by Christians against Christians, Europeans against Europeans, armed against unarmed, and left utterly unpunished. There was no reprisal by any government. In those days, before the Reformation, before the American and French revolutions, before religious freedom was an idea that took hold, the Christian establishment and the ruling families reigned together. If there was argument, Religion won, because it had God on its side. 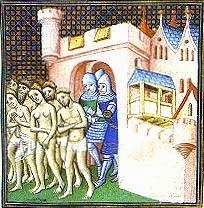 In today’s western world, massacres like the one in the Languedoc over religious beliefs no longer take place because the churches and the states have been separated. Today's dear Pope Francis, (or the head honcho of any religion in the West) should he lose his mind and decide to massacre everyone in say, Sienna, would not get far with his plans. I hope the secular and the sectarian are never reunited in my part of the world and I hope, for the sad people of the Middle East who are forced to live with governments commingled with religious ideology, that their situation changes for them one day. Life gets cheap when religious leaders have armies and they get good and angry. Ah, but we are an ignoble beast. Things haven't changed a helluva lot. So the sentiment I occasionally see on T-shirts "Kill 'em all - Let God sort them out" is much older than I ever thought.